Now that the party’s over, let’s get down to business. Seems like a good candidate to put American poker back in the game, right? As with any politician’s election, Senator Reid came with attachments – chits used to back his successful campaign – and those backings are soon to be cashed in. The land-based gaming industry is a major supporter of Harry Reid. That sole interest will be relying on the Senator to promote its agenda. This is where common ground can be struck. The land-based gaming industry, like every industry, is made up of a wide range of business interests. These interests run the range from conservative to progressive. And while they may not agree on the how’s and when’s of the internet, they all recognize the potential. The advancement of the international gaming market brings technology, management and expertise, which translates into well-paying careers and growing digital industries. Also, they know that money talks loud. This is the mission: Poker players, related gaming bodies, and poker businesses must now assist the New Senate Majority Leader in understanding the role that American Leadership and American Entrepreneurship can take in the growing international gaming market. Use the daily coverage of the international markets from the UK, Europe and Asia as verified proof that American Poker is conquering the world. Frame the discussion smartly so that it convinces before it has even begun. Stop using negative, tainted phrases such as “online gambling” and “offshore”. Start using positive phrases such as “international gaming market“, “leadership“, “ingenuity“, “well-paying careers“, and “entrepreneur“. Senator Reid can pave the way to overturning the underhanded UIGE Act. He can open opportunities for American Poker to regain its leadership. He just needs help from us all – the Poker Players. Harry Reid Online gaming advocates were high fiving after the mid-term elections as many of their mostly Republican foes were unseated. But this was an admittedly small battle in the war to undo the UIGEA. If online gaming is to win the war, they have an uphill struggle relative to the issue of regulation with the new Democratic Senate Majority Leader Harry Reid. 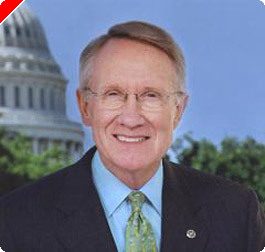 On the surface, Nevada Senator Harry Reid looks like the perfect focal point for the issue of internet gaming. In 2001, Reid was awarded an Industry Leadership Award from the American Gaming Association. What does Harry Reid know about gaming regulation? Plenty. Reid was the Chairman of the Nevada Gaming Commission from 1977-1981. It was a particularly challenging period in Nevada gaming history as mob influence was prevalent and public opinion was low. As Chairman, Reid ushered in a new era of responsibility, paving the way for Nevada’s almost epic economic development. But it wasn’t easy. His life was threatened on numerous occasions; once when a car bomb was placed in his family’s station wagon. When Reid denied a gaming license to Stardust Casino executive and convicted sports fixer Frank “Lefty” Rosenthal, the showdown was so dramatic it was eventually portrayed in the movie Casino. But even with his public anti-online gaming position, maybe Reid is the right person at the right time for online poker. He obviously understands the economic benefits of the gaming industry and he has been open to legislation that would study the potential to legalize and regulate online gaming in the US. But to do this and do this right, it means that online companies can’t just hide behind the cloak of offshore locations and hope that a skill vs. chance argument eventually filters through the court system. To turn Reid into an ally, online poker needs to come forward and articulate its ability to be regulated and demonstrate its willingness to contribute to the US economy via taxation and jobs. Those are the issues that resonate with Harry Reid and, to every extent, have defined his career.